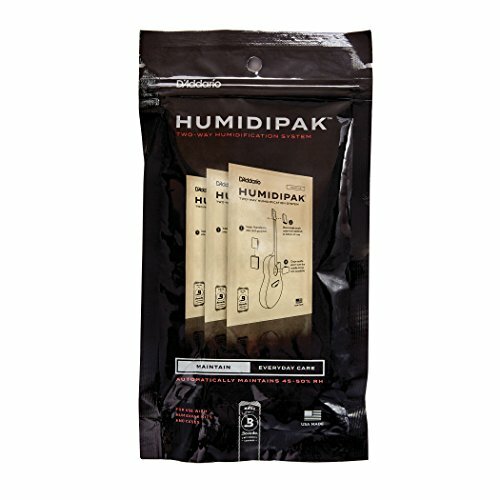 View larger Humidity Control The Planet Waves Humidipak system is a patented "two-way" humidification system that can add or reduce humidity within an instrument and its case. This eliminates the guesswork and maintenance commonly associated with other humidification products. It's All Relative The Humidipak system lets a musician store their instrument and feel confident that it will be kept at a constant level of relative humidity. The 45%-50% relative humidity level that the Humidipak resides at is ideal for protecting and preserving the finish and wood of an instrument. Safe and Sound From your beginner instrument all the way up to your prized high-end acoustic, all instruments are susceptible to warping, cracking, and other damage. By resting in the soundhole and at the headstock of your instrument the Humidipak system helps you avoid these issues, and other problems that can cause expensive repairs. 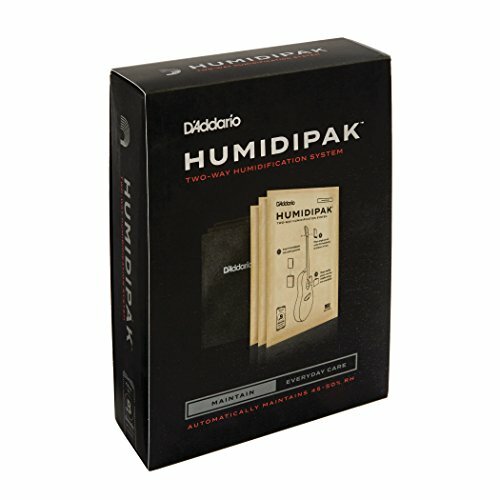 TWO-WAY HUMIDITY CONTROL - D'Addario Two-Way Humidification System is the only maintenance-free two-way humidity control system for guitar. It automatically maintains the optimal 45-50% relative humidity level within your instrument case by adding or depleting moisture as necessary. REPLACEMENT PACKETS - Once the Humidipaks become firm, discard and replace using the three refills that come in this Two-Way Humidification Replacement Pack. On average, the packets will last 2-6 months depending on the geographic location and the conditions of which the instrument is exposed to. MAINTENANCE-FREE - Unlike refillable humidifiers, the D'Addario system is maintenance-free. It is long-lasting and does not require any adjustments based on seasonal temperature changes or geographic locations. No water, no drips, no mess. PROTECT YOUR INSTRUMENT - The patented two-way purified humidity control system protects your instrument against warping, cracks and other damage caused by lack of humidification. This system eliminates the guesswork and anxiety of maintaining your instrument's proper humidity level. By placing the D Addario Humiditrak Bluetooth Humidity and Temperature Sensor in your instrument or case, you can protect your investment from damage caused by large and rapid changes in humidity and temperature. Humiditrak uses a patent-pending Bluetooth sensor to provide a constant stream of temperature, humidity and impact data to alert you of hazardous conditions that can lead to diminished playability, costly repairs and lost value to your instrument. The Humiditrak device fits easily into any instrument case and unobtrusively clips securely in place to constantly monitor the conditions of your instrument without taking up additional space. 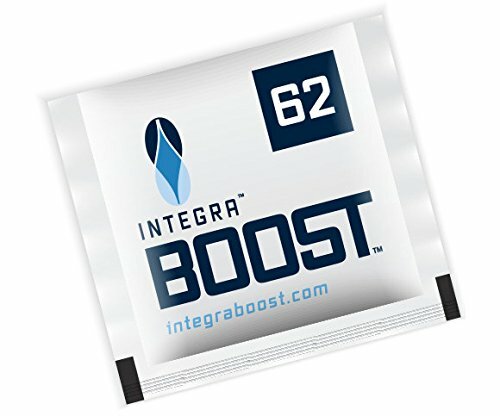 A CR2032 battery that will last for a maximum of two years is included. Simply download the free app from the iTunes Store or Google Play for Apple and Android devices. You can view humidity and temperature trends for up to 7 instruments daily, weekly and monthly to stay on top of conditions that might be potentially harmful to the instrument. When Humiditrak detects dangerous conditions, push notifications are sent to your mobile device allowing you to take corrective action before damage occurs. Cataloging and monitoring a collection of instruments is so easy and convenient, you ll want one for every instrument you own! For over 20 years, D Addario has been leading the industry in innovative and problem-solving products that serve musicians worldwide. D Addario Accessories (formerly Planet Waves) are proudly made in a state-of-the-art manufacturing facility in the USA to the most stringent quality controls in the industry. The D Addario family s heart, soul and love for making music is put into every accessory we create, and we never stop inspiring performance. PROTECT YOUR INVESTMENT: The Humidtrak's Bluetooth sensor provides a constant stream of temperature, humidity and impact data to alert you of hazardous conditions that can lead to diminished playability, costly repairs and lost value to your instrument. EASY TO USE APP: Download the free app from the iTunes Store and Google Play. You can view humidity and temperature trends for up to 7 instruments daily, weekly and monthly to stay on top of conditions that might be potentially harmful to the instrument. STAY UPDATED: When Humiditrak detects dangerous conditions, push notifications are sent to your mobile device allowing you to take corrective action before damage occurs. You can easily catalog and monitor a collection of instruments! ONE SIZE FITS ALL: The Humiditrak device fits easily into any instrument case and unobtrusively clips securely in place to constantly monitor the conditions of your instrument without taking up additional space. CR2032 battery included. D'ADDARIO ACCESSORIES: For over 20 years, D'Addario Accessories (formerly Planet Waves) has been leading the industry in innovative and problem-solving products that serve musicians worldwide. 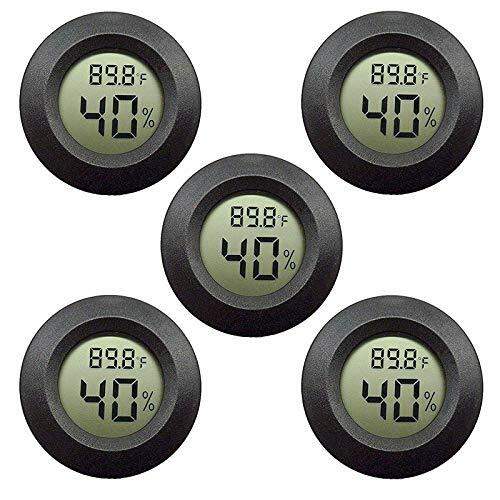 Accuracy humidity monitor Indoor thermometer displays temperature in Fahrenheit or Celsius. 14 to 122 degrees Fahrenheit; -10 to 50 degrees Celsius. 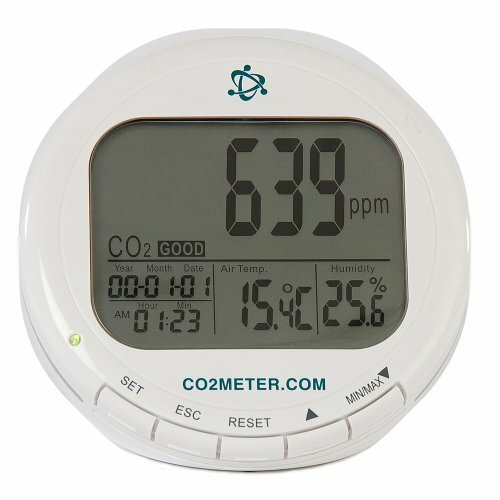 Comfort Level Indicator Level icons indicate DRY, COMFORT,WET condition, this hygrometer thermometer track indoor humidity temperature in time to adjust the humidifier, dehumidifier settings. Easy operation This thermometer and hygrometer is a touch screen display, you can operate by touch button, and you want to display it for you to read. Smart Function Backlight to help to read in the dark, touch button control, F/ C Selector, reset button to initial state, clear max min memory. Handy alarm clock ,easy to take ,Provide all the information you need to start a great day. 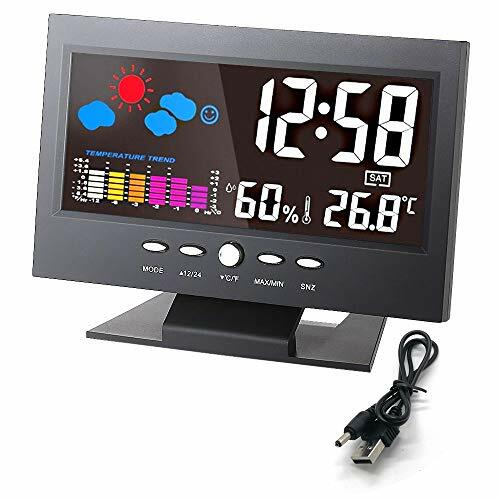 The color led digital clock works as a hygrometer, thermometer, clock, alarm, calendar, shows you the week/day, weather forecast. APPLICABLE SCOPE Temperature and humidity use a wide range, High accuracy and high stability,suitable for indoor and outdoor, such as bedroom, baby room, office, greenhouse and so on. The classic black can be an elegant decoration of your room. Q&A Q 1 : Is this alarm clock difficult to set ? other reviewers said it very dificuly to set . A : Never worried about that ,after bought this item ,you will recive a video to teach you how to use it . Q2 Is the alarm loud enough ? A : YES ,it's loud enough to wake a heavy sleeper. Q3 : Does this product have a 12hour am/pm mode? A : YES . we have both 12 and 24 hour mode ,just press the "12/24" button till the time change into 12(24) hour mode. LIGHT OPTION: The sound activated LCD light feature saves energy and keep the batteries long lasting . The backlight lasts 8 seconds and then goes out. you can Clap or press theSNOOZE/LIGHT to activate the back light if you need. The Vicks Starry Night Cool Moisture Humidifier provides soothing, cool, invisible moisture and a calming environment to help your child sleep. 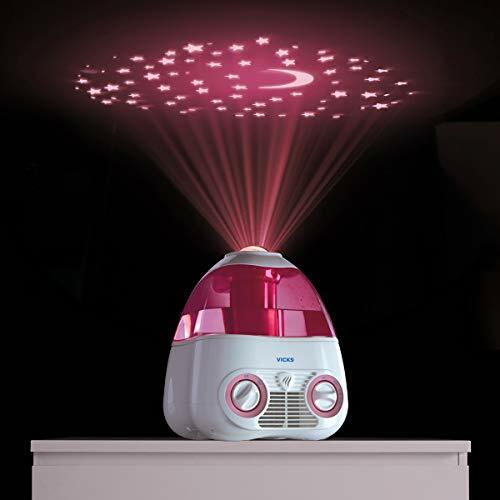 The V3700-M features a projector screen that transforms you child s room into a starry night sky. Its scent pad heater produces soothing menthol vapors for added comfort. Automatic moisture balance system. environments, one product to meet the needs of multiple products. 1.Q:Temperature sensor reads too high in the day time. A:Make sure the thermo-hygrometer is mounted in a shaded area on the north facing wall. 2.Q:Indoor and Outdoor Temperature do not agree. within 2 C(the sensor accuracy is 1 C). Use the calibration feature to match the indoor and outdoor temperature to a known source. 3.Q:Display console contrast is weak. A:Replace console batteries with a fresh set of batteries. New version - Three-channel temperature and humidity meter with 3 transmitters for various environments. 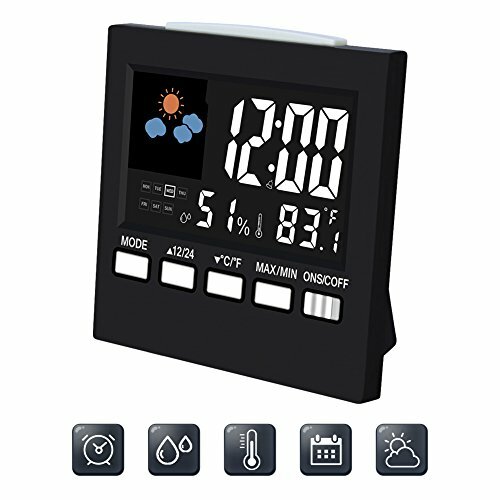 Maximum and Minimum Record - It can record the temperature and humidity timely,display temperature and humidity changes of the main unit and 3 transmitters. Clear HD LCD Screen - Easy-to-read display as well as the humidity smiley icon shows that 45% is dry, 45%-65% is comfortable, and more than 65% is wet. Upgraded Version- Backlight Function - Backlight shows digit clearly and wide field of view. Press the display backlight to turn it off automatically after 5 seconds. Two Mounting Options - This indoor outdoor hygrometer thermometer suport base stand & wall hanging, very convient to place. NOTE: We provide 45-DAY MONEY BACK GUARANTEE & 1 YEAR WARRANTY. We guarantee to REFUND your money or REPLACE if you encounter any problems with it. 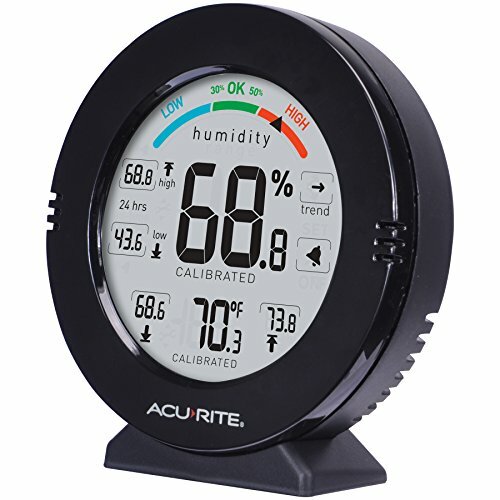 With an AcuRite Pro Accuracy Indoor Temperature and Humidity Monitor with Alarms, you get reliable Information that can help you ensure a comfortable living space, and better air quality, all while taking steps to preserve your home's interior and valuable possessions. Compact, easy to use, and offering a variety of mounting options, it's a must-have for any home or office. 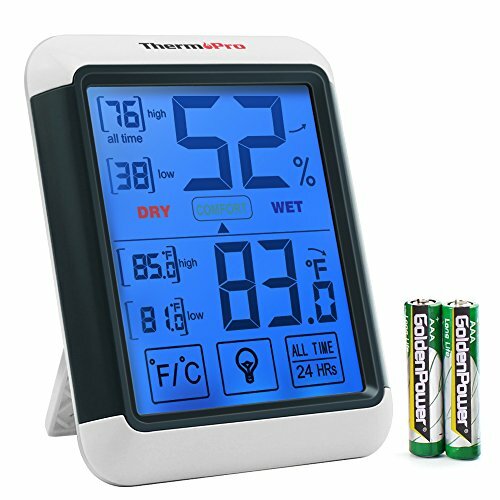 The humidity level indicator easily conveys whether humidity levels are too low (blue), ok (green), or too high (red) at the top of the display, based on relative humidity (RH) guidelines set by the Environmental Protection Agency (EPA) for health and comfort. Why Are Humidity Levels Important? Too much humidity can cause an increase in biological pollutants, like mold, bacteria, viruses, fungi, and dust mites that can trigger respiratory health ailments. Not enough humidity in your home can lead to nosebleeds, painful skin irritation, difficulty breathing and damaging static electricity. Humidity levels also have an impact on the plant growth, as well as the health and comfort of animals. INDUSTRY-LEADING SUPPORT - Includes a limited 1 year warranty as well as access to our knowledgeable US-based customer service team. 5.MAX/MIN: Press MAX/MIN to view max temperature and humidity record; Press MAX/MIN again to view min temperature and humidity record. HIGH RELIABILITY & ACCURACY ; Measuring temperature range: -9.9 ~ +60 14.2 F~ +140 F ; Measuring humidity range:20%-99%; Display: Max/Min temperature and humidity records. VOICE-ACTIVATED BACKLIGHT : The backlight can be also start by the sound of a gentle hit on the table or a clap within the range of 1 meter. The backlight will automatically turn off in 5 seconds(In order to save the energy of the batteries). The sound control function can be turned on or off by the switch S/C on the back of the LCD clock. Temperature, Relative humidity are play important role in comfortable home and office. Homidy humidity gauge aims to give a higher Precision for each family. Guard family health together. Sunstroke risk : High Temperature is adverse in summer, especially for baby and elder family. Cold risk: Low humidity will lead to chapped Skin,lower immunity, it's easy to have a cold for baby,grandpa, grandma. 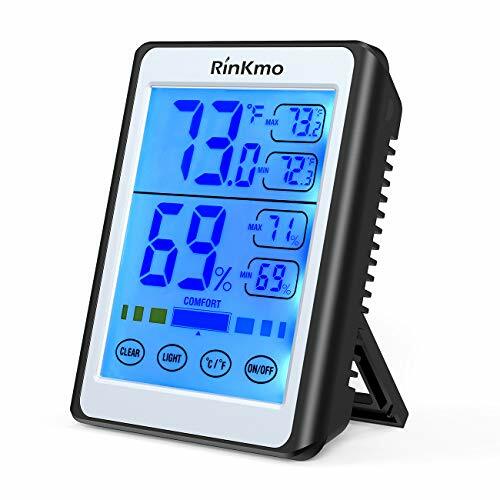 Food mildew Risk: In 2019, Homidy Thermometer hygrometer will be sweet birthday gifts, Thanksgiving, Christmas, New Year presents,fashion UI design,delicate package, and deeply blessing. 1.) 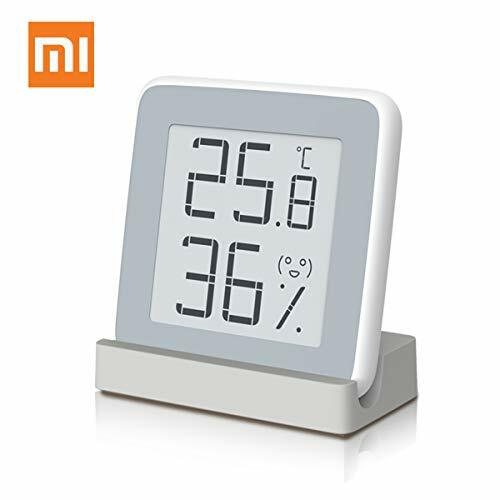 The humidity thermometer screen state will update every 30 times data renewal, it's normal to enter into white screen to get higher HD Display effect. with a small pointy obstacle like wooden stick or cotton bud to Switch into F it comes with automatically . 100% return and exchange service guaranteed within 60 Days, 3 years warranty Promise! Xiaomi Mijia 2019 Special Version High contrast 360 degree HD E-ink Display, more clear than LCD screen, especially at dim room or under sunlight. Elegant Design,exquisite packaging was used. High Accuracy Digital Sensors Industrial Grade Swiss Sensirion sensors was used, which can detect subtle humidity and temperature changes at office or home. Temperature difference 0.3 (0.0 ~ 60.0 ), humidity 3%(0 to 100% RH). Professional for indoor room. Temperature range Design for Higher resolution needs. 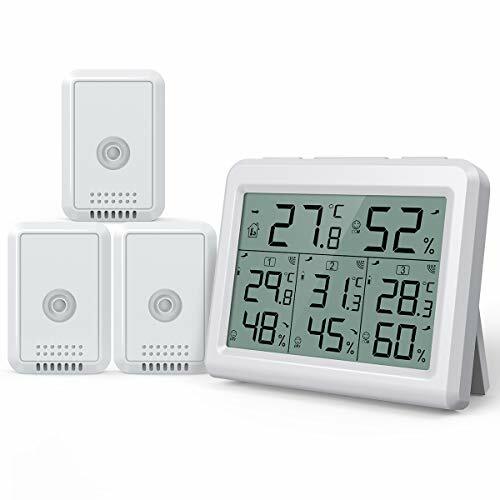 360 HD E-ink Screen First indoor thermometer with Rare HD E-ink display , 360 HD-free viewing experience on wall or your desk protects your eyesight and Guard family's health. Low power consumption and delicate appearance, nice for home decorations or as birthday, Thanksgiving,Christmas, New Year gifts business gifts, etc. Simple Aesthetic UI Design Inside / switchable button(Long Press inside back cover conversion button with pointy item like cotton bud and stay 4-5 seconds); 3D surface, bright and rounded; Elegant UI design with 6 types of expressions that show Six mood and comfort level. Eco-friendly materials & Authority Certification Eco-friendly materials such as PC / ABS + PMMA via Safety certificates such as FCC / EMC / CE / ROHS Included Low consumption, A 240mAH CR2032 button cell contained 100% after-sale warranty within 36 months, welcome email us anytime.